Inducted 1993. Nearly Three Decades as Head Scorer for Boys Basketball. 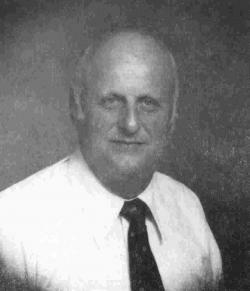 Bob Miller has been chosen to be inducted into the 1993 Hall of Fame Class for his many years of service to QND. Miller is entering his 28th season as head scorer for QND boys basketball. He has kept score for the Raiders both at home and on the road. He also has filled in when needed at girls basketball games and has kept the books for lower level games as well. Miller also has been on the chain gang for football down markers at QND, completing his 27th season this fall. Miller has served on the boys basketball parent committee for many years and has been a board member of the QND Athletic Booster Club since its inception in the 70s. Miller says his proudest achievement is putting four children through QND and seeing them, as well as his 2 grandchildren, graduate from QND. He also has twin grandsons who will be graduating from QND in May of 1994 and 14 more grandchildren to come. We’re sure this means continued service for a few more years from him.